Earlier this month, Xibo developers announced the beta version Xibo for Android was available for testing. 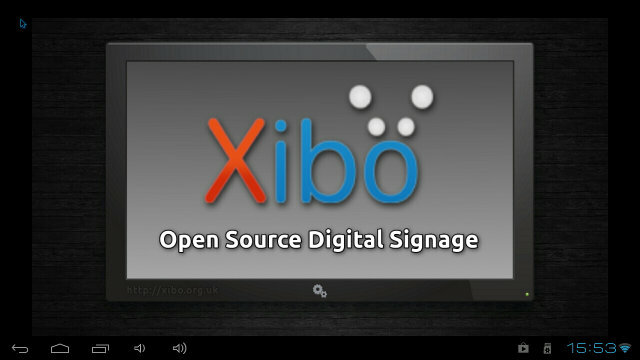 Contrary to the Linux & Windows clients and servers which are open source, Xibo for Android is developed by Spring Signage and will available commercially. This sponsorship will help finance the development of Xibo open source software: the 2 clients (.net in Windows, Python in Linux), the server and API. Full Compositing (overlapping regions) and Video Transparency. If you want to test the Xibo client for android, you can register for the private BETA and download an APK (Xibo_Android_Clientv1.0.12.apk) to install on your Android devices. Being part of the BETA program will also guarantee you a price of £10 GBP per client for Xibo 1.4.x releases, should you choose to purchase the final version. 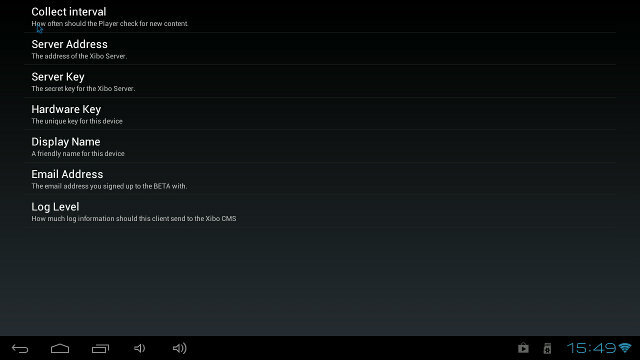 After installation, you’ll see Xibo Settings. You’ll need to fill the “Server Address” (e.g. http://192.168.0.103/xibo), the server key defined in Xibo dashboard, an hardware key (e.g. mele_xibo), and provide the email address you used to register to the beta program. Once you run the program, you can click anywhere on the screen to pop-up a window with debug information. I mainly used Mele A1000 media player (AllWinner A10) for testing, but also did a quick test on WM8850-MID tablet. I tried several layouts, and most of them worked, but one was shown as invalid. The layouts include scrolling text (Twitter RSS feed), jpeg pictures, an mpg video and the mobile version of a famous tech blog . Everything appears to very smooth and usable, contrary to my try to run Xibo on ARM Linux. Beside the invalid layout issue, I found out that the Status bar is always there, but just dimed, and this appears to be problematic to solve on most Android devices according to Spring Signage developers. You can watch Xibo for Android running on Mele A1000 below, and see for yourself that it runs pretty smoothly. The main problem is that the scrolling text is cut because of the Status Bar. On WM885-MID tablet, Xibo did not work as well. The status bar was obviously still there, but the full layout was shown (possibly due to the different resolution), and although the text was not cut out, the font size was incorrect (too small). But the biggest problem was the failure to play the MPG video I used. Based on my first evaluation, even though Xibo for Android will cost at least 10 GBP ($16 US), it should still be worth it considering you can now buy mini PCs / HDMI sticks for $30 to $50 (e.g. MK802) that can run Xibo smoothly with most features. I would also expect Xibo for Android to run nicely on the $35 Raspberry Pi (512 MB RAM version) once a proper Android port for the platform is released. Of course, if you need Powerpoint and/or Adobe Flash, you’ll still need to spend over $100 to get a Windows client.